I have been in training all day and have to admit I was a bit nervous about the whole food situation. The training is being held at a conference center that is in a remote area outside of Minneapolis. With no car, there is not really the option to sneak out to a grocery store or salad bar for food, so I have been completely dependent on the food options of the conference center/hotel. 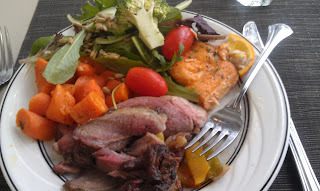 Luckily, there have been lots of options and I have been pleasantly stuffed with good food. After an early morning yoga session, I was ready for some food! I ordered an omelet with onion, peppers, and tomatoes. 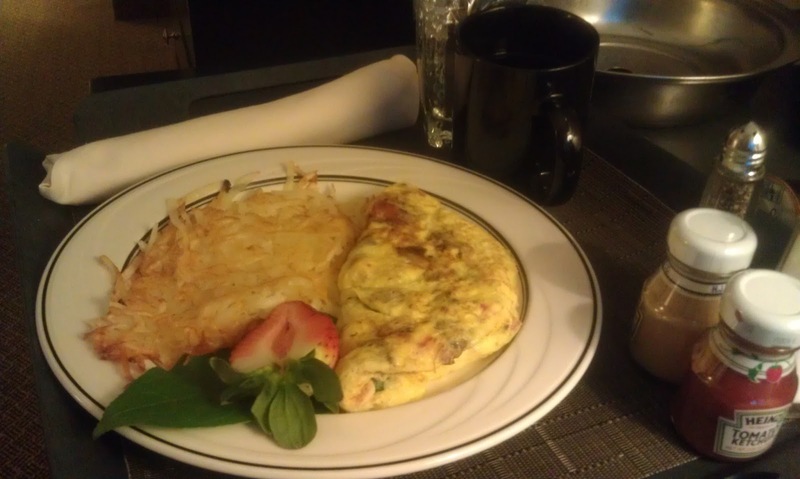 I didn't eat the hashbrowns or strawberries. 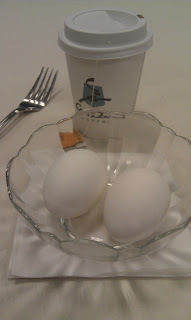 Normally I LOVE hashbrowns with my eggs, but these were sitting in a pool of butter and just didn't seem appetizing. So I was not too sad to shove them off my plate. What is it about sitting in a room all day listening to people talk that makes you soooooo hungry?! I was ready for something else at around 10 am. Luckily among the pastries and bagels, they had hard boiled eggs! SCORE! I snagged a couple and some chai tea. Perfect mid-morning snack. I went for a pre-dinner run, so I was more then ready for a full plate of goodness! 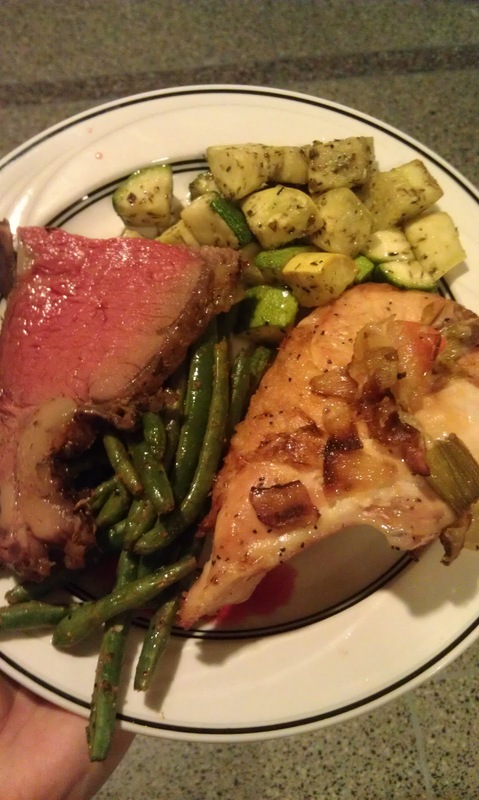 Prime rib, green beans with a spicy curry seasonings, baked chicken and sauteed squash. I went back for seconds on the prime rib. It was done just the way I like it! Boy, did I fill up on good food today! I am going to miss these big meals when I get home. In addition to the wonderful training I received today (hope to blog about this later), I felt very successful and empowered today. I walked away from all your typical conference foods. The cookies, the chocolates, the dessert tables, and sodas. I didn't miss them at all and was very focused on the training and meeting new people. I do have to tell you about a very weird thing that happened to me at dinner. I was sitting at one end of the table talking to my neighbor when I got a scent of red wine. It was as if I was a vampire getting a whiff of human blood. The smell was sooooo strong. I stopped conversation and had to look around. The wine was being served about 10 feet away from me!! It really did smell like it was right under my nose. I asked the person I was talking to if they could smell it and they had no idea what I was talking about. Talk about heightened senses! Of course, I stared down that glass of wine the whole night and silently begged the drinker to hurry up and finish it so I didn't have to smell it anymore. Crazy! Another day of training and airport traveling tomorrow!